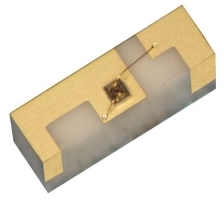 PS05F1 is an assembly of a single PD10F1 photodiode chip mounted onto a ceramic carrier with wrap-around metal pads for anode and cathode connections. PD10F1 is an InGaAs/InP high speed photodiode chip with a dual-pad layout and large optical aperture. The top illuminated photodiode is optimized for single-mode data- and telecom applications up to 12 Gb/s and offers an excellent responsivity and a high speed of response in the wavelength region from 1260 to 1620 nm. Over this entire wavelength range, an AR coating provides low reflectivity and high return loss. The photodiode is optimized to provide the best trade-off between a large active area and low capacitance and achieves full speed at low bias voltages. Assembly on spacer, wrap-around carrier etc.